LOOKING FOR A REAL WORKSHOP & THE MOST BEAUTIFUL HOME & PROPERTY? This AMAZING property is the best of boths worlds, fabulous rural living within Newcastle City Limits, only minutes to OKC & Norman. BEAUTIFUL 3 bed home with TWO living areas, one with panoramic views of the gorgeous 2.5 acres. LARGE kitchen with eat in breakfast bar, formal dining in massive kitchen, beautifully REMODELED bath, lots of storage, large Master with built-ins in closet, secondary bedrooms are large too, LARGE inside utility. Approx. 1,311 sq. ft. WORKSHOP W/9' ceiling, thermal windows, 200 amp electrical, built-in work bences, addiitonal carport/garage, plus attached 1 car garage ALL w/overhead door openers. 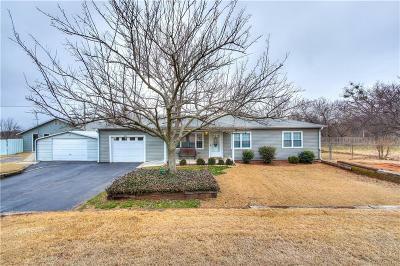 Storm Shelter, Alarm System, HWT approx 5 yrs old, Heat replaced 2014, Air replaced 2012, New electrical panel,newer double pane, double hung windows, new siding & guttering approx 4 yrs old, gas lines replaced 2010, added blown insulation in floored attic, new carpet, hardwood under carpet & MORE!